We can cover your every desire in the way of designing a distinctive look for your vehicle. There is no such thing as a job too small. If you have your own design or ideas on how you would like the artwork done to your vehicle, we will sit down and walk through the process with you whether it be Airbrush or Vinyl finish. 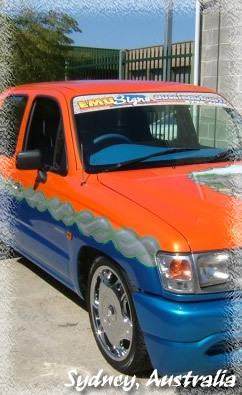 We will take an image of your vehicle and then proceed to overlay it with the design that you desire and develop the effect from there..
Due to the demand for our quality work and design we are now making this service available to those who like the finish of airbrushing effects on their own vehicle.